As Instagram portfolios overflow with images taken with ever-improving iPhone cameras, Austin-based artist David Johndrow continues to make platinum-palladium, cyanotype and gum bichromate prints, observing minute details that most of us overlook. 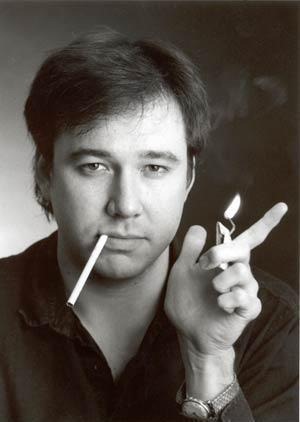 Growing up in Houston, Johndrow became close with the late Bill Hicks, an uncannily hilarious, foul-mouthed and cathartic performer of comedy and social satire who remains an iconic influence on American culture and beyond. Johndrow and his photographs contributed greatly to the British-produced documentary “American: The Bill Hicks Story,” which premiered at SXSW in 2010. I caught up with the artist recently to ask about his latest goings on via email. JA: You grew up with the late Bill Hicks and took many photographs of him, and you’ve talked about how he encouraged you to pick up the camera. Do you find that your experiences with him still inform your work? all of the ideas that society and culture instill in you and to forge your own path. His main message, for me, was to think for yourself. JA: What do you think it is about Bill that still resonates so strongly with people? DJ: Bill wasn’t afraid to speak aloud what people are feeling inside. Also, he was funny as hell. Humor comes from recognized truth. Maybe that’s why there aren’t any funny right-wing conservative comedians. But that’s another topic.